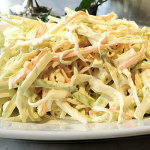 This is a classic Coleslaw, perfect for summer barbecues. A good recipe for picnics and an absolute for the American Diner classic, a Burger deluxe. Check out my recipe for Quick Pickles to go with your burgers. This is also a great side dish for pulled pork, roast meats. The apple and vinegar in the recipe make it light and fresh. 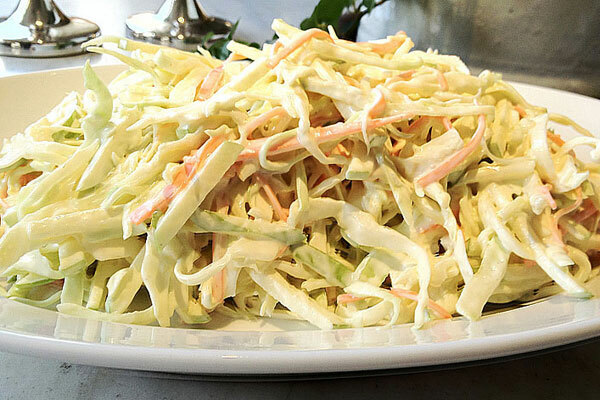 A classic recipe for coleslaw and the perfect accompaniment to your summer barbeques and picnics it only takes a few minutes to put together. Mix mustard, vinegar, sugar, salt, mayonnaise and the crème fraiche together in a large bowl. Shred the cabbage as finely as you can. Take the the carrot and apple and cut into fine match sticks. This is a pretty classic recipe and is delicious and easy to make. You should let it sit for about 2 hours - longer is better. It can even be made the day before. Back home a barbeque just wouldn't be a barbeque with coleslaw. Check out my recipe for Quick Pickles to go with your burgers. I suggest Hellmans mayonnaise because unlike Swedish brands is mayonnaise and not dressing, and has no sugar in it. I find Hellmans at my local ICA Supermarket.